This is a supplemental set for the two lessons entitled "The Many Faces of Me." 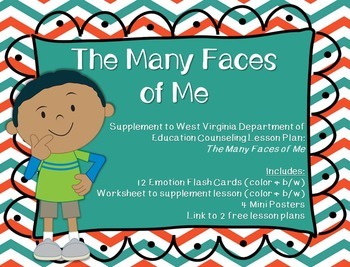 from the West Virginia Department of Education School Counseling Curriculum. -Happy, Sad, Scared, and Mad--All Belong to Me: Students will be able to communicate effectively within and beyond the classroom. This set comes with a flashcards (color and b/w), a worksheet (color and b/w), and 4 mini-posters. The link for the free lesson plan is included on the credit page.